When people do Google searches about health problems, they're most likely to be looking up pain, cancer, or diabetes. That's one of the big takeaways from a new Google Trends study of the millions of searches related to health issues: which health problems people worry about most, how the seasons affect searches, and how epidemics spread. Why it matters: This is the first project of its kind, and gives new insight into the seasonality of the public's health concerns, as searches related to maladies make up about 5% of all Google searches. The Google News Lab gave Axios an exclusive first look at the data. 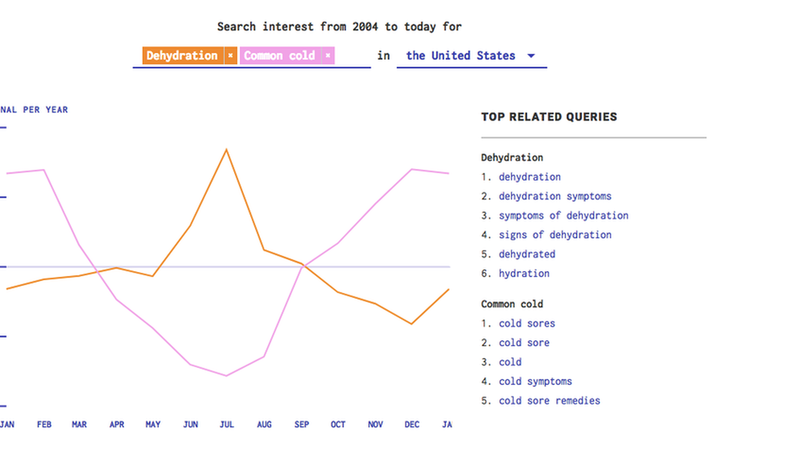 Keep in mind: These charts can only describe seasonal trends of health searches. It can't explain them. While searches about a disease may partially be influenced by the number of people who have symptoms of that illness, they're not necessarily or directly correlated. More research would be needed to document the reasons behind the searches. Most searched: Since 2004, around the world, the most common searches for health issues were pain, then cancer, with diabetes most commonly coming in third. It was occasionally replaced by acne and in 2004, HIV/AIDS. Seasonal trends: Searches related to the flu, bronchitis and the cold are significantly more common during the winter, while dehydration, skin rashes and Candidiasis — likely caused by wet bathing suits — peak in the summer. And during the spring, allergy-related searches are most common — as well as chicken pox, since the spring is the peak season for the disease. Campaigns: Advocacy initiatives like Breast Cancer Awareness month cause the number of searches related to breast cancer and cancer in general to skyrocket in October. And for ALS, there was a significant spike in searches related to the disease in the summer of 2014, when the ice bucket challenge became popular. Holidays: After New Year's Day, searches for chest pain are the most popular, plausibly due to increased food and alcohol consumption related to the holidays, which could cause heart problems. Epidemics: The project also maps out how epidemics like Ebola, Zika and yellow fever spread all over the world. Watch their interactive map, here. Go deeper: See Gabriel Gianordoli's visuals for yourself and search for other health trends on your own, here.